Battling it's way onto Blu-ray and DVD this summer, comes Warner Bros' remake of Clash of the Titans. The ultimate struggle for power pins men against kings, and kings against Gods. But the war between the Gods themselves could destroy the world. Born of a God, but raised as a man, Perseus (Sam Worthington), is helpless to save his family from Hades (Ralph Fiennes), vengeful God of the underworld. With nothing left to lose, Perseus volunteers to lead a dangerous mission to defeat Hades before he can seize power from Zeus (Liam Neeson), and unleash hell on earth. Leading a daring band of warriors, Perseus sets off on a perilous journey deep into forbidden worlds. Battling unholy demons and fearsome beasts, he will only survive if he can accept his power as a God, defy his fate, and create his own destiny. This film has had a bumpy ride for myself, and some of the FlickDirect staff. It was first panned by most of us because it had so much potential to be such an amazing film (Original Clash of The Titans theatrical review). However, this time around, let us approach it from the material it is made from. Taking away the nostalgia value of the original Clash of the Titans you have an extremely “B” quality film. The story is extremely weak, the acting extremely sub-par; and if you take away the amazing stop-motion special effects by Harry Hausen, you have a story that just simply falls flat. Let us, by contrast, consider the 2010 remake - The story is a bit contrived to provide some semblance of sense, the character dynamics are a bit better, and the special effects are out of this world. If you take each scene by itself, you will be blown away by the power of the gods and mythology behind Clash of the Titans 2010. Warner Bros Home Entertainment spared no expense with this remake transfer to Blu-ray. The 1080p/VC-1 is simply amazing -- bringing the picture to a new level that was not even achieved in the movie theater. That combined with the fully dynamic DTS-HD Master Audio 5.1 fill really contains some great eye candy. Aside from the movie, Warner Bros went all out on the special features: Maximum Movie Mode, Focus Points, Sam Worthington: An Action Hero for the Ages, Deleted Scenes, Alternate Ending, and DVD and obligatory digital download. If you are looking for a full eye-candy night of fun, then Clash of The Titans is it! Just realize what it is – a "B" movie; do not expect a masterpiece, such as Christopher Nolan’s Inception. All of you, who enjoy it, do not worry because the adventures of Perseus are just beginning -- there are two more headed our way in the next couple of years. Download Clash of The Titans from the iTunes Store in Digial HD. 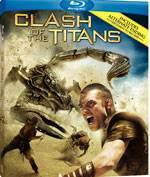 For more information about Clash of The Titans visit the FlickDirect Movie Database.